In the last couple of weeks hundreds of soccer shirts have been arriving at the Projects Abroad office. Both the English Premiership’s Arsenal and the more local Colden Common Youth Soccer Club have sent through a wide selection of shirts. Jesse Banks-Hudson went out to Togo as the first volunteer on our soccer project there this summer. On his return he contacted Arsenal, the team he supports, and they sent through a selection of shirts. The shirts have now arrived to great enthusiasm in Togo. A big thank you to Jessye. Thank you also to Graham Spencer from Colden Common Youth Soccer team. Graham contacted us earlier in the year to say he had a few spare shirts. We ended up receiving over 200 shirts that are now all around the world. 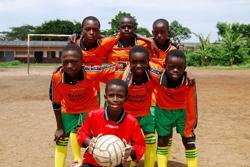 We have young players wearing orange Colden shirts in Ghana, Sri Lanka, Malawi and Ukraine. Thank you to everyone at Colden Common for their support.